The Inns of Court manuscripts (approximately 1570-1650) are named for the various London lodgings where lawyers traditionally trained and worked, all still active. Along with education in law, knowledge of dancing was clearly considered an important skill for young men. 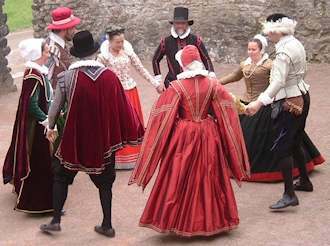 We have no step descriptions and, until 1600, no music, but these records show a social world of Revels, or grand parties, that included many dances: stately, flirtatious and lively. Anne will take us through these ancient records and help us all to capture something of the spirit of the dances on the dance floor. Come and join in. Pastime is a friendly group and Anne Daye is an authority on historical dance. No experience, partner or costume necessary. Wear comfortable clothes that won’t restrict your movement and soft shoes without a heel. Please bring a packed lunch.